From left: Dana Parker, UC Clermont director of development, takes on Bob Pautke, executive director of LEAD Clermont Academy, president/founder of SOAR with Purpose and president/board chair of Connect Clermont, in a Pop-A-Shot game during The Main Event, the college’s annual fundraiser for students. More than 150 UC Clermont College faculty, staff, alumni and community members gathered Friday, March 26, at The Main Event to raise $62,000 in support of the college’s students. 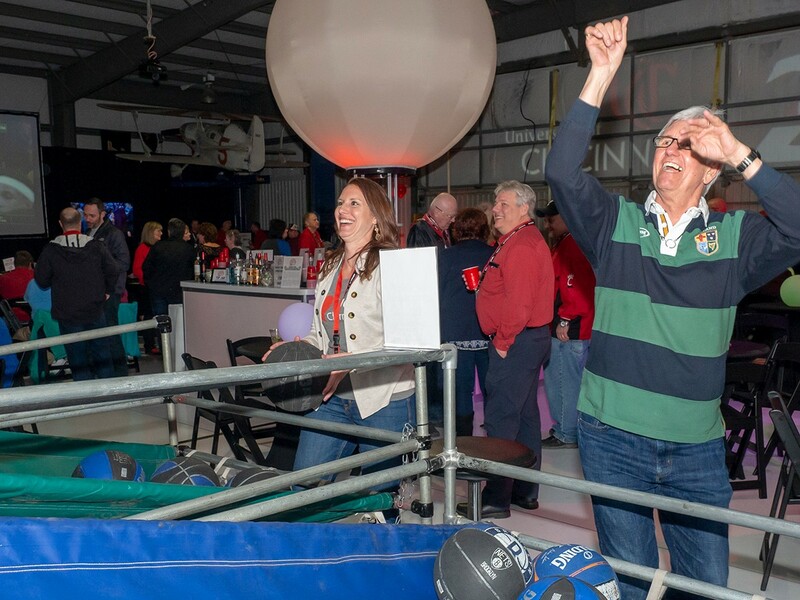 Guests at the event, held at Sporty’s Academy Hangar near campus in Batavia, enjoyed a March Madness-themed evening cheering on their favorite teams in the NCAA basketball tournament. A 19-foot TV took center stage, while several smaller screens displayed games throughout the hangar. Tickets included complimentary food and drinks, including signature martini and bourbon cocktails. Attendees went head-to-head in a ping pong and a Pop-A-Shot tournament. Pick-a-key raffles and an online auction were also available. Learn more about the college by visiting ucclermont.edu.